Laid Off Loser: Laid Off Loser Album of the Day: "Purple Rain"
It's Friday and time for a party record. And you can't go wrong with one that includes the lyrics "Animals strike curious poses/They feel the heat/The heat between me and u." Few albums from the Eighties could be rightfully called timeless, but this synth-funk masterpiece is one of them. It's the pinnacle of the brief period when Prince and his sexual guitar could do no wrong. These days, the Purple One is but a shell of who he once was. 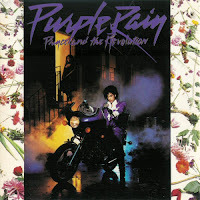 But that'll never take away from Purple Rain, the soundtrack to the best unintentional comedy ever. Check that — the best film ever. There. I said it. Citizen Kane? Boooring. And it doesn't have a purple motorcycle or Morris Day.